If you’re Greg McGarity, the problem with telling a journalist in an interview about the ticket price increase that “We had to do this to make ends meet,” is that you run the risk of said journalist doing his job to find out whether that’s actually the case. It begged the question: Is that actually true? Did Georgia have to raise ticket prices to make budget? DawgNation undertook an examination of the finances of the UGA athletics department, using available data, information gathered over the past year and insight from an independent financial analyst. If you honestly have to ask what the analyst concluded, you haven’t been reading this blog often enough. Oh, okay. I know the suspense is killing you. The irony is that any financial risk faced by UGA athletics linked to its football program is now even lower than ever, which would make any such purely voluntary ’emergency fund’ even less needed than before. Say it ain’t so, Joe. I’m shocked, shocked, to hear that. But what about McGarity’s prior excuse for an $80 million reserve fund — the green umbrella for that rainy day that never seems to come? Maybe the rainy day fund needs its own rainy day fund. In Georgia’s case, it’s the coming raises for Smart and his staff that have yet to be revealed. Publicly, they may be the reason for raising ticket prices. But Seaman said he suspects the real reason is simple economics. Seaman doesn’t explain why McGarity isn’t capable of being straight about that, but I’m pretty sure we don’t really need any special insight there. “We are paying less and less attention to the schools that are not in contention,” the former Alabama quarterback said. “I would love to know, on a minute-by-minute basis, the comparison between the 10 teams that we discuss as having a chance at the College Football Playoff on this radio program. And, look, it’s not our fault. We go where the callers want to go. Where do we spend the majority of our time? We spend it on 10, maybe 15 teams. Maybe 20. Because it’s a caller-driven show and calls are most likely going to be on teams who are in contention for the College Football Playoff. This is the price you pay for kissing ESPN’s ring, for taking Mickey’s money. Because when ESPN decides it is in college football’s interest — meaning it’s in ESPN’s interest — to shift from its traditional regional appeal to a broader, national audience, this is what you get. The conferences, the joy of college football for college football’s sake is diminished in a reach to attract more fans who are less passionate about the sport. The result is an emphasis on the playoffs and a de-emphasis on what used to matter to the typical fan of a conference program. For now, it’s not hitting us because Georgia is in the thick of things. But McElroy’s making a lot of sense with regard to the bigger picture. Given that Mickey signs his paycheck, it’s even a little brave on his part. Not that anybody’s going to do anything about it. Georgia checks in third in ESPN’s first 2018 preseason FPI, behind Clemson and Auburn Alabama. The truly interesting part is that Georgia’s second on the offensive side, with Oklahoma being the only team ranked higher. I guess we’re not going to hear many “the offensive line is a real question mark” stories this summer. Bill Connelly points out one other note of interest from the 2018 signing classes. Holy crap, Georgia and Ohio State! Per the 247Sports Composite, the Bulldogs and Buckeyes combined to reel in 10 five-star prospects and 35 four-stars among their 52 total prospects. Both classes were among the best ever recorded. No. 3 Texas crept above 247’s 300-point mark as well. 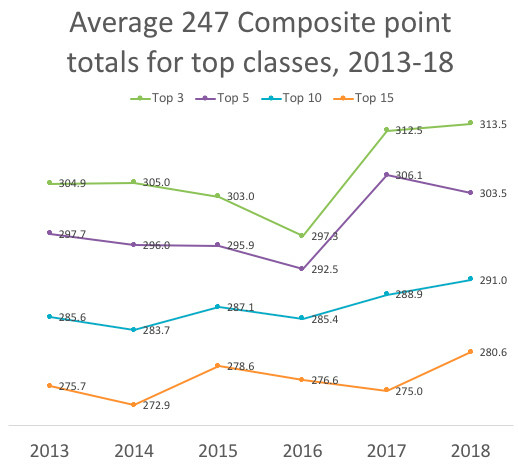 It was the second straight year that each of the top three classes scored at 300 points or higher. In 2016, the No. 1 class (Alabama’s, naturally) was barely above 300. In other words, top-heavy is fine, as long as you’re part of the top. Georgia is now. There are a lot of SEC East teams that have some serious climbing to do. That gap ain’t gonna close itself. That in turn has led to this amusing flight of fancy. Trey Burton was made aware of a painful bit of knowledge when Notre Dame’s appeal of an NCAA ruling that vacated the Fighting Irish’s victories during the 2012 and 2013 seasons was denied. The former Florida player, who has been a tight end with the Philadelphia Eagles, used Twitter on Tuesday to express that the Gators would have played for a national title to end the 2012 campaign if Notre Dame wouldn’t have been eligible to face Alabama in the game. Manti Te’o’s girlfriend would have approved of this… if she existed, of course. Apparently, there are some bridges that even Sexton can’t cross. According to a report from Gridiron Now’s Mark Nagi, who recently spoke to Kiffin for an upcoming book on Tennessee football, former Vols athletic director John Currie told super agent Jimmy Sexton that his client would “never be the head coach” at Tennessee as long as he was in charge. Of course, if I had to pick a bridge, it would be Junior. Sexton had to know the job was dangerous when he took it.